It’s one thing to talk about history and quite another to LIVE HISTORY. My association with Ed Parker began at BYU in 1954. I was a, ‘green as grass’ freshman; and wanted to attend all the events on campus. During a basketball half time, the winter of 1954 I witnessed a demonstration of Kenpo, put on by Parker and a group of Islanders he had trained. This was before there were any videos, or TV presentations, and Kung fu movies were as yet un known. I was blown away! The speed power and efficiency of their techniques was phenomenal. I had been trained in fencing at Napa High School, Napa California before leaving to attend college at BYU. Some of the blocks, parries and counters were reminiscent of fencing theory; I had to learn more! In those days Ed Parker was quite Jingoistic. He only trained Island boys and Asians, with an occasional law enforcement exception. It took a lot of pleading and persistence before he relented and took me under his wing. The day came, shortly before his untimely death, when I got a phone call from my friend, instructor and the brother I never had. 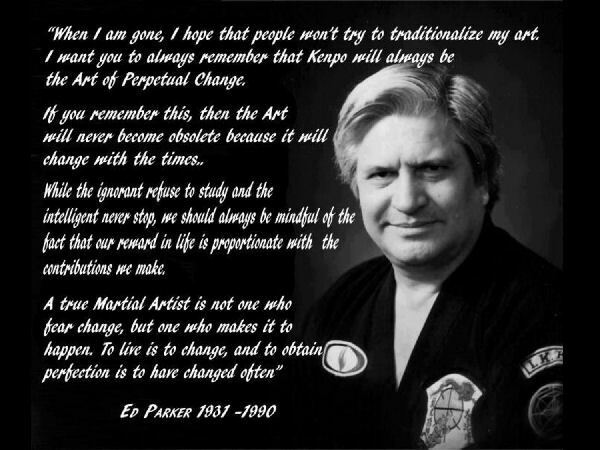 He said, “Mills, I have seen the “future of Kenpo. His name is Jeff Speakman.” He then went on to describe his movie career, his skill set and most of all his creativity. He then asked me to befriend Jeff, support him and assist him in any way possible. The subsequent loss of Ed Parker was tragic; but the legacy he left continues to grow, because of men like Jeff Speakman. When I got that phone call, I knew exactly what he meant. We had discussed it many times in private. Particularly when polishing the development of the International Kenpo Karate Association, (IKKA). Ed Parker didn’t want to develop super ‘Robots.’ His goal was to create “Thinking Warriors,” capable of building on what he, Ed Parker, had created; and expanding the art in ever widening ripples of creative discovery. That is what he saw in Jeff Speakman; and that is what we continue to witness. Each generation of “thinking warriors” expand the frontiers of the art. We are all privileged not just to be observers; but to be participants in history. Thanks in no small measure to leaders like Jeff Speakman.